I've recently started playing around with the latest Raspberry Pi 3 B+ along with a PoE HAT, which is an amazing little piece of kit. I've been trying to offload a bunch of workloads that are currently being served by an aging Windows 10 PC whose primary role is a media PC. This very same PC used to run Windows Media Center on Windows XP, before I turned to XBMC/Kodi and then Plex. It's well over a decade old, but still going strong. Although, now that I think of it, the only thing that's probably still original is the case, since I've replaced the motherboard, videocard, disk drives, and power supply over the years. Since I've worked with Docker in the past (most recently with a failed attempt to move the Skype Optimizer to a Docker container), I thought I'd try running Docker on the Raspberry Pi. 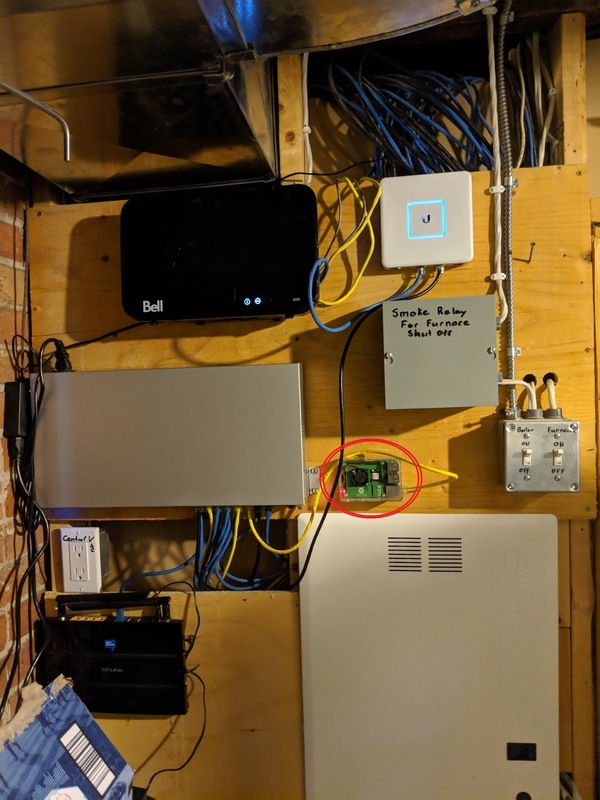 My home networking setup in the basement furnace room. My Raspberry Pi is circled in red. Traefik - an easy-to-use reverse proxy solution so that I can access the different container UIs by using https://containername.skypeoptimizer.com, instead of http://192.168.1.x:somerandomport. It also simplifies certificate management, since I only have to do it once in Traefik with a wildcard cert, rather than on every container. Pihole - a DNS blackhole for ads. Blocks ads for all devices on my internal network. Tidbit: its currently blocking almost 50% of my total DNS queries! NOIP - publishes my ever-changing public IP address to Noip.com. It was the last one that took me the most work to get going. While there are several published PowerShell Docker containers for Linux, there didn't seem to be any that would work with the ARM processors inside the Raspberry Pi. After much trial-and-error (story of my life), I finally managed to build a working Docker image that works with the Raspberry Pi. I used some of the bits from this TechNet blog to get the right commands, but had to make some modifications for it to work on the latest Raspberry Pi version. I'm using this base image to build other images that run simple scripts on a schedule. For example, I've got one that checks my public IP, and updates an Azure DNS record when it changes. It does the same thing as the NOIP one, but its something that's fully under my control. For those who are interested, the base image is available on https://hub.docker.com under kenlasko/powershellpi. The DockerFile used to build this image is shown below (since I haven't figured out how to display it on Docker Hub yet). My next move is to get a few more Raspberry Pis to create a Docker Swarm to automatically load-balance my containers, just like a wee little datacenter! This is for you, Pat!